Unlike the early days of mix martial arts (MMA), fighters who found success in the cage while training in only one particular style of martial arts are long gone. Other than illegal tactics like groin shots and eye pokes, MMA rules do not restrict the usage of techniques from different combat sports. This is why training in MMA is the best option to prepare you for real life encounters that involves hand-to-hand combat. The following content provides training tips and strategies for becoming a well-rounded MMA practitioner. Being able to take a person to the ground and the use of MMA gloves are unique aspects of MMA that forces even experienced strikers to adjust their striking technique, as they make their transformation to becoming a MMA fighter. This section focuses on how to modify your previous striking experience in order to maximize its effectiveness in the cage. Striking Defense for MMA - Due to the small size of the MMA gloves, you will not be able to hide behind it and absorb shots with a tight high guard as you would in combat sports that utilizes boxing gloves. Therefore, it is imperative to actively incorporate head movement drills and be vigilant about entering and exiting at angles to minimize damage taken. Adjusting Your Stance - Utilizing traditional martial arts’ stances and upright postures will make you more prone to be taken down. As a striker transitioning to MMA, you should work on lowering your stance as you perform various footwork drills. 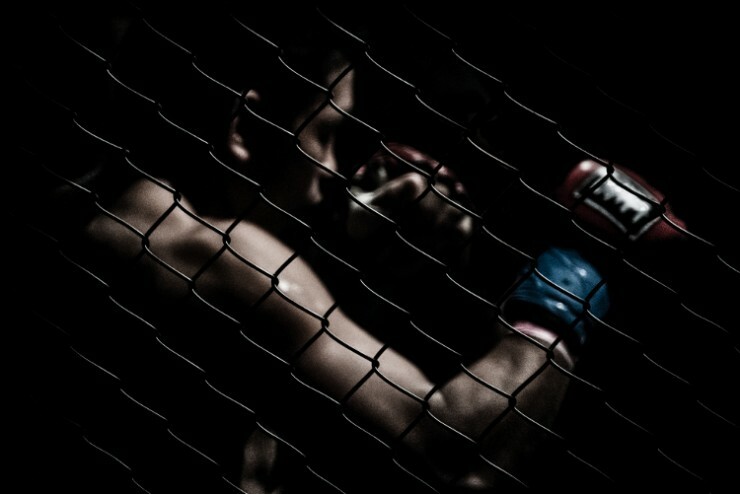 Cage vs. Boxing Ring - Even though some MMA competitions are still held inside boxing rings, it is becoming more of a commonplace for MMA fighters to compete inside cages. The distinct differences in shape and size between the two fighting stages makes it important for you to develop the awareness needed to properly control the center of the cage. Taking Advantage of MMA Rules - Practice using techniques, illegal in other striking combat sports, to your advantage. For example, using a overhook clinch grip to whizzer the opponent with your off-hand and position them where you can throw short tactical shots, such as uppercuts and knees. Kicking - Many fighters are afraid to throw kicks, especially ones that targets the upper body, due to the risk of being taken down. The following is a short list of tips to consistently perform effective kicks in MMA. Treat Your Kick Like a Whip - As soon as your kick lands, immediately draw the kicking leg back into its original position. Otherwise, having your leg lazily hang around after impact is simply asking the opponent to catch and use it to take you down. Timing - Practice timing kicks when your training partner is out of position to properly defend themselves against it. An example of a perfect time to throw a low kick is when the opponent is moving away from your punching range. Setting Up Kicks - To increase your chance of landing a successful kick, set up your kicks with punching combinations to occupy the opponent’s attention and make it harder for them to defend against it. Hammer Fist for Ground and Pound - A striking technique for efficiently delivering damage to grounded opponents are hammer fist strikes. Drill these strikes on a grappling dummy or a heavy bag laying on the mats. Having the capability to take down your opponents with vicious throws or slams will sap the energy from their body and even have a chance of knocking the wind out of them. This section describes exercises to improve your ability to get a takedown as well as defend against it. Integrating Sprawling Movements Into Your Striking Drills - If you follow MMA athletes social media accounts, you will see fighters work on throwing striking combinations and then immediately executing a sprawl. These drills help them develop the natural reflex to quickly shift their body movements in order to sprawl and stuff the takedown attempt. Balancing Exercises - Grapplers aim to perform a takedown when their opponent’s position and balance are compromised. Use balancing exercises to improve your ability to recover from awkward positions. Practice balancing yourself on top of a stability ball or a balance board. Not only does this exercise enhance your ability to recover your balance, it will build sensitivity in your feet to develop quicker reactions. Threatening a Takedown Attempt - Similar to using feints in boxing to open up a defensive fighter, you can use fake takedown setups to expose your opponents to strikes. For example, a UFC fighter named Chad Mendes likes to deceive his opponents by changing his level and faking like he is shooting for a double leg. As his opponent reacts by transitioning from a striking stance to a sprawling position, Chad uses this opportunity to hit them with a powerful uppercut. Prime Takedown Opportunities - Look for the following opportunities to take down your training partner in live sparring sessions. Shoot for a takedown when your teammate launches forward and overly commits to throwing a punch. Their momentum prevents them from being able to change directions and make the adjustments needed to stop your takedown attempt. Force your opponent to be defensive from your striking combinations. When they turtle up with a high guard, their hands will be occupied and their lower body is left opened for the taking. Recovering From a Failed Takedown Attempt - It is critical in knowing how to recover from a failed takedown attempt instead of being sprawled upon. To do so, practice transitioning from a lower body takedown attempt to immediately rising back up and obtaining an upper body clinch position as you feel them successfully stopping your initial progress. One of the things you will quickly learn is that grappling on the ground in MMA is a lot different from your standard Jiu Jitsu sparring sessions because of the strikes involved. Being on the Bottom - Any time you find yourself on the bottom and in an inferior position, you must work on scrambling back to your feet or implement techniques that sweeps the opponent and gives you the dominant position. Otherwise, hanging out in the bottom position will cause you to absorb unnecessary punishments. Controlling the Opponent In Your Guard - Upon being taken down and unable to scramble to their feet, fighters will then work to get the opponent into their closed guard. The following are tips on how to control the opponent in your guard and minimize the damage taken before you progress to your submission or sweeping techniques. Control Points - Actively look for control points to disrupt your opponent’s ability to hit you or break your guard opened. Aim to obtain wrist, bicep and head control. High Guard - As you break the opponent’s posture with your head control, work on sliding your legs up higher on their back to obtain the high guard position. Keeping your legs tightly wrap around their body and having your knees pull towards your chest will make it extremely difficult for the opponent to posture up and throw powerful ground and pounds. Overhook - Implement an overhook grip to completely neutralize the opponent’s ability to strike with the trapped arm. Throwing Strikes to Create Openings - When you acquire dominant positions in your sparring sessions, look to use striking techniques like elbows and hammerfists to create submission openings as your training partner tries to defend themselves against these attacks. When fighting against a superior striker that is able to stuff your takedown shots, it is vital for you to be able to back them up against the cage and smother their offensive output. Furthermore, you could then use your ability to clinch on the cage to deliver vicious strikes of your own or perform a takedown from this clinching position. These same things cans be used against you, so it is essential to develop your defensive skills as well. Live Takedown Sessions - Find training partners for practicing takedowns against the cage. No strikes should be thrown during this exercise. Rotate in a new teammate whenever there is a successful takedown or position reversal. Throwing Strikes From the Clinch - For this drill, focus on throwing strikes instead of taking your training partner down. Concentrate on controlling your their body and head position as you throw knees, elbows and uppercuts from the clinching position. Be mindful to only throw light strikes, especially to the head. It will also be useful to wear a headgear for this drill. Wall Walk - Wall walk is a great training exercise for using the cage to get back up on your feet. Have your teammate take you down against the cage and then practice using it to execute a wall walk as they try to fight your movements with 50% resistance.